A season is on each panel - Winter, Spring, Summer and Fall. As you move from right to left you can see all four seasons come to life. 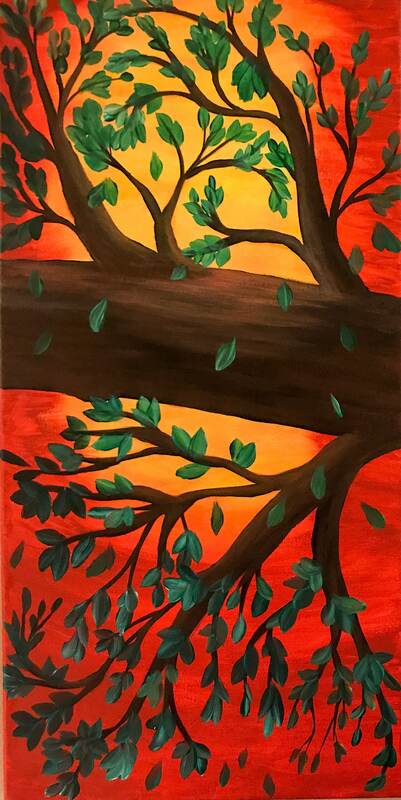 These canvas panels strike bold and contrasting colors to make this an eye popping expression of passion and forms a tree. The canvas originals are wrapped with stapled back and sealed to protect the painting from harmful UV light. This work of art consists of 4 panels each 24"x12"x1" which mean without framing it would take up a space of 24"Hx48W"x1D (framing and spacing) would make the space requirements larger based on its framing and how much space is placed between each panel. Each item is packed to for safe arrival with lots of packing material and the package is insured. Extra care is given to packing each piece to make sure it arrives whole and in a timely manner. Items usually ship within 1-3 business days within the continental USA via USPS.